Not today but this weekend: fired up the 05 turbo after refreshing it a bit(gaskets & O-rings and a few other bits) and some light mods. Runs good only 1 oil leak (one of the o-rings in the oil cooler/filter stack). Now on to the fun part: tuning for mods! already have a VF39 and STI ECU, this was mostly cleanup: aftermarket stainless downpipe, 3" exhaust from the turbo back tucked where it oughta go with flex and flanges (was stock DP to a straight stick of pipe hanging under the bodywork), TGV deletes, evap cleanup, and intake pipe/turbo inlet. Was on a Cobb Stage 2 tune but they have them write protected so I have to start over. 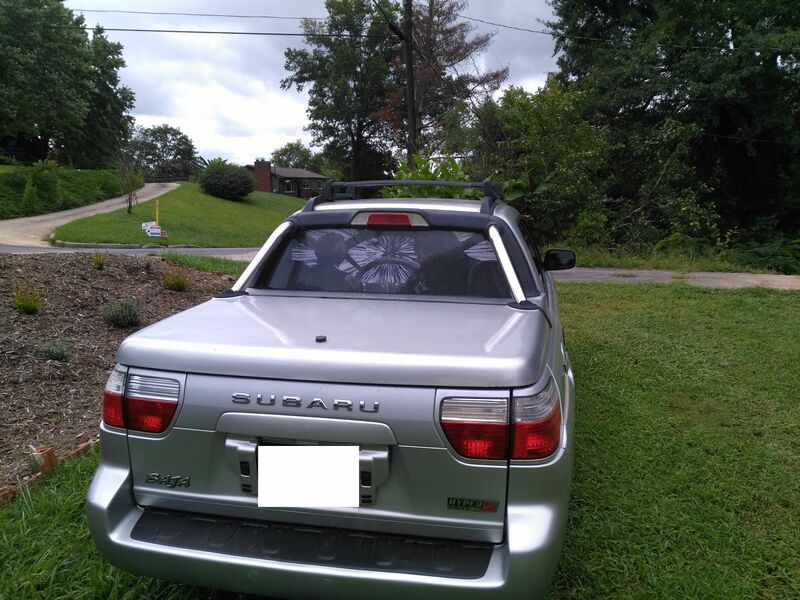 This post is more of a compilation of what I did all summer to my silver 06 Baja sport. Beyond the list, nothing major needed to be done as the truck runs great and just ticked over the 80k mark last week. -Nothing too major, but I put a set of led headlight bulbs into my 06 Baja. I got tired of buying the regular bulbs just about yearly and went with led so I dont have to change them ever again (fingers crossed). -Rally bar from Rally Inovations to hold 3x Baja Designs Squadron Sport led lights, two are driving combo and the third is a 9* spot light. -1" lift with spacers from ADF. It took 8 hours for my dad and I to do this as neither of us had done this sort of work before. Totally worth it though, the truck looks better and the higher clearance is a godsend for the terrible roads where I live. -Just got a set of Nokian Hakkapelitta r3 snow tires for this upcoming winter. I'm stoked to actually have good winter tires for once. -Replacing more inside and outside bulbs with LEDs as the original ones burn out. -I'll need to get pictures of it. But I added some snaps to the tailgate so I could fasten a tailgate pad on the back for hauling my bikes around. None of the regular bike pads by Raceface/dakine/yakima/thule were short enough to fit right so I had to use a surfboard pad. Works great and looks goooood. Sent it to the shop for a new radiator, timing belt and all accoutrements, plugs, wires and air filter. Today...Put in HID's, was going to buy non-turbo single bulb housings and put in led's or extend the cap in the original housing with some pvc pipe so led's would fit, but this way seemed cheaper and easier. I was going to buy some JDM HID housings but after looking closer they looked pretty much identical to the non-hid housings, so I just got the hid conversion on amazon for $28. Light is bright and well focused, not pointing up at oncoming drivers. I should have did this a year ago, seems to work well. Last project I did before this was a few weeks ago, tgv deletes, so far no problems with that either. Not today, but first mod on my new-to-me Baja. Forgot these were on my camera so here's a late 6-month update on the Bolsal exhaust. Aside from some nasty surface rust on the flanges, so far so good. Bear in mind too that this is with NO WASHING for the entire winter, purposefully to torture test this exhaust.